The outflow from the Independence Pass Transmountain Diversion System, heading east, on June 7, 2017. The recently released Upper Roaring Fork Management Plan names transmountain diversions as a main cause of low flows. After months of delays and challenges to the planning process, the city of Aspen quietly unveiled the Upper Roaring Fork River Management Plan earlier this month. The plan names the stretch of the Roaring Fork River through Aspen as the most at-risk and cites transmountain diversions as the main cause. The plan, which was a joint project between the city of Aspen and Pitkin County, identified impacts to streamflow and developed goals and strategies to protect river health in the Upper Roaring Fork watershed. 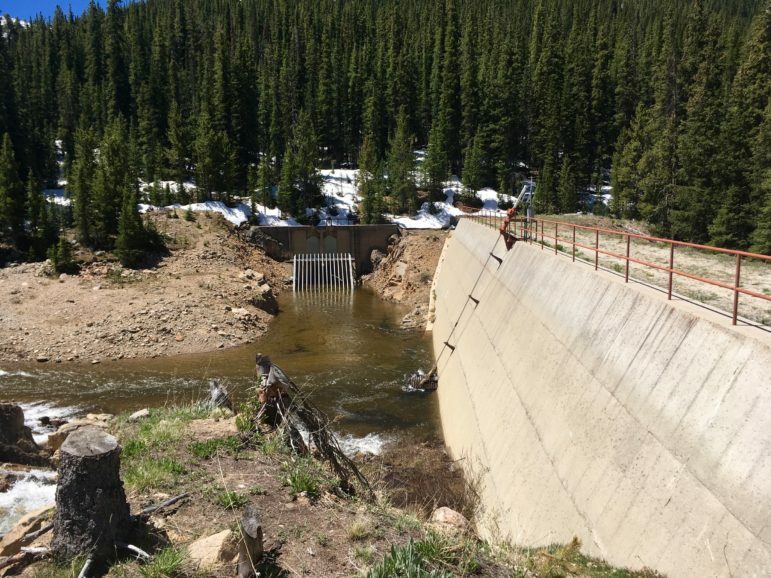 A new river management plan released from the city discusses the impacts on the Roaring Fork River from the Independence Pass Transmountain Diversion System, which includes a diversion dam across the main stem of the river near Lost Man campground. The plan includes a list of ways to put more water in the river. Because of sensitivity around two instances of ongoing litigation — the Busk-Ivanhoe settlement involving transmountain diversions and Pitkin County and the city of Aspen’s conditional water storage rights for the potential Castle and Maroon reservoirs — the focus of the plan shifted after work on it had already begun. DSS, or decision support systems, are computer models that let water managers simulate how different factors might affect stream flows. The plan compiles years of studies and data, provides an assessment of existing conditions and provides a framework for making decisions to improve the ecological health of the Upper Roaring Fork River and its tributaries. The plan mentions several water management opportunities that warrant further investigation such as dry-year water leasing with the Salvation Ditch Co. and municipal raw water supply reductions. April Long, City of Aspen clean river program manager, presented the plan to the Pitkin County Open Space and Trails board at its June 7 meeting. The board recommended sending it to the Pitkin County Commissioners for approval. “The important thing from the board’s point of view is that we want scientific, responsible information before we do some of our projects on something as sensitive as the river,” said Graeme Means, chair of the Pitkin County Open Space and Trails board. 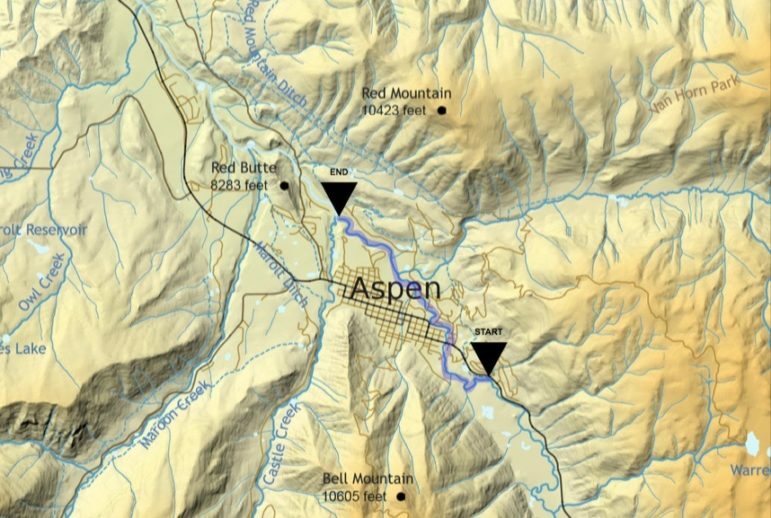 A map prepared for the Upper Roaring Fork River Management Plan that shows the stretch of river near Aspen that is heavily impacted by diversions above it. The community ranked this reach as the one they would most like to see management to improve ecological conditions. The plan evaluated eight reaches in the Upper Roaring Fork. On the the main stem of the Roaring Fork, consultants looked at from Lost Man Creek to Difficult Creek, Difficult Creek to Salvation Ditch and Salvation Ditch to Castle Creek. They looked at the tributaries of Lincoln Creek from Grizzly Reservoir to its confluence with the Roaring Fork, Hunter Creek from the Fry-Ark Project diversions to its confluence with the Roaring Fork, Castle Creek from Conundrum Creek to its confluence with the Roaring Fork and Maroon Creek from West Maroon to its confluence with the Roaring Fork. The Roaring Fork River through the City of Aspen emerged as the reach most at risk, with riparian health, flow modification, water pollution, development and land use, habitat fragmentation and aquatic flora and fauna all ranking as poor or at high risk for impact. The minimum flow set by the Colorado Water Conservation Board to maintain ecological health — 32 cfs — is often not met on this stretch in late summer. The plan also clarifies community values surrounding rivers and water and found that the stretch of the Roaring Fork that flows through downtown Aspen also is the most concerning to the public. This stretch of river, and most of the river upstream of Aspen, could soon see roughly 10 to 30 more cubic feet per second of additional water as a result of a pending settlement between Pitkin County and the Colorado River District and City of Aurora. 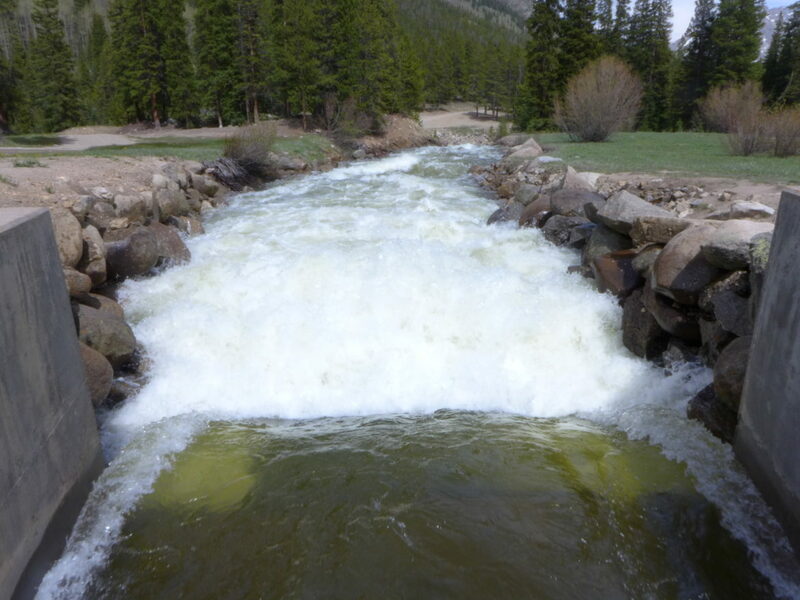 The water court case settlement concerning the Busk-Ivanhoe transmountain diversion is expected to let as much as 1,000 more acre-feet of water run into the Upper Roaring Fork River each year instead of being diverted under Independence Pass to the Front Range. It was this pending case that contributed to the delay and change in scope to the plan. It was originally scheduled to be released in July 2017. The Roaring Fork River running through the Cascades section of the river near the Grottos. The flows through this section are dramatically different during spring run-off on the occasions when the transmountain diversion system under Independence is turned off. The diversion system has a significant impact on the Fork, including the section that runs through Aspen. 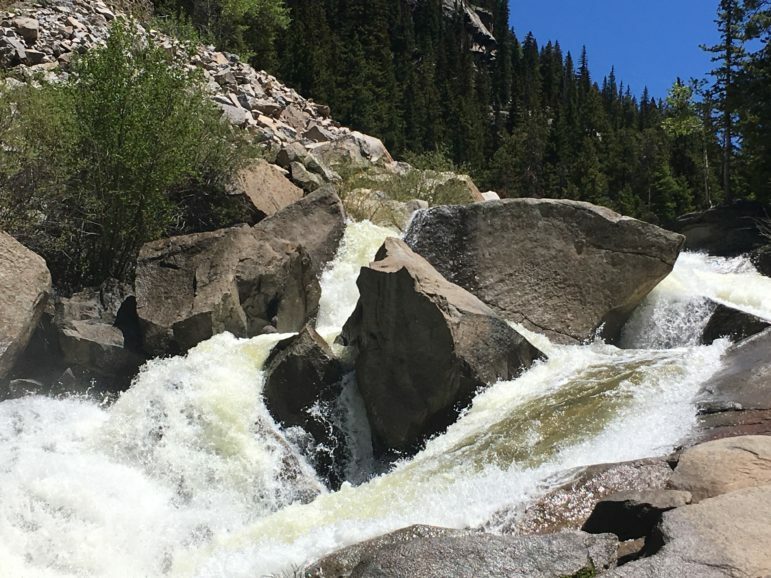 The risk for impact to the river from flow modification was ranked as high or moderate on all eight evaluated reaches of the Upper Roaring Fork watershed. Most of those modifications to flows in the Upper Roaring Fork watershed come in the form of transmountain diversions, which reduce the yield in the Roaring Fork River above Mill Street by 40 percent. The plan names the Independence Pass Transmountain Diversion System as the primary cause of human-caused shortages in flows. The IPTDS completely dewaters portions of the Upper Roaring Fork River for significant periods each year, according to the plan. Operated by the Twin Lakes Reservoir and Canal Co., the system takes an average of 43,000 acre-feet per year from the Roaring Fork headwaters through Twin Lakes Tunnel No. 1 to the Arkansas basin where it is used for East Slope municipal and irrigation purposes. The tunnel under the divide can move 625 cfs of water out of the Roaring Fork basin. But despite the Twin Lakes Reservoir and Canal Co.’s outsized role in the health of the Upper Roaring Fork and that representatives from the company served on the plan’s technical advisory group, the company’s president Kevin Lusk said he has not been involved in anything related to the plan in over nine months. Although he participated in early meetings, Lusk said he had not seen the plan until Aspen Journalism sent it to him and therefore has not read it and cannot comment. The plan, which cost $200,000, was funded 50-50 by the city and county. Pitkin County Open Space and Trails Director Gary Tennenbaum said the county has a lot of concerns about the water in the Upper Roaring Fork River, especially near the North Star Nature Preserve a few miles upstream from the city limits. The county also owns parcels adjacent to the Roaring Fork River between Aspen and Woody Creek in an area known as the Gorge.